Let us discover Doha, capital of Qatar and a city embracing modernity while at the same time maintaining all the nuances of the Arab tradition. A sightseeing tour delving into the oldest souk of the city with a visit to a magnificent museum or to a settlement in perfect Arab style (subject to opening days): one excursion, a lot to discover. We leave the port behind us by coach and go on a guided tour of Doha, which means “the great tree” in Arabic and is the shiny cosmopolitan capital of Qatar. Our fist stop is Souq Waqif, the capital’s fascinating bazaar crossed by wide roads flanked by cafés and restaurantsthat, on the side roads, give way to a myriad of little shops managed exclusively by men where you can find truly anything: ceramic and fabric, spices, Arab sweets, candied fruit and traditional clothing as well as the classic souvenirs. We continue our sightseeing tour along La Corniche, the amazing waterfront winding along the large bay overlooked by the city and flanked by alternating old and modern buildings.In the port, dozens of old wooden ships evoke Qatar's glorious maritime past. We continue as far as the West Bay Area, the most modern part of the city with its tall buildings and reach the capital's most glamorous district: The Pearl-Qatar, a vast complex built on an artificial island featuring high residential buildings and luxury villas, famous hotels and luxury shopping malls, international designer boutiques, cafés and restaurants. We pass by Doha Golf Club, an enormous facility with two courses and the most modern equipment, as well as the headquarters of famous TV network Al Jazeera. 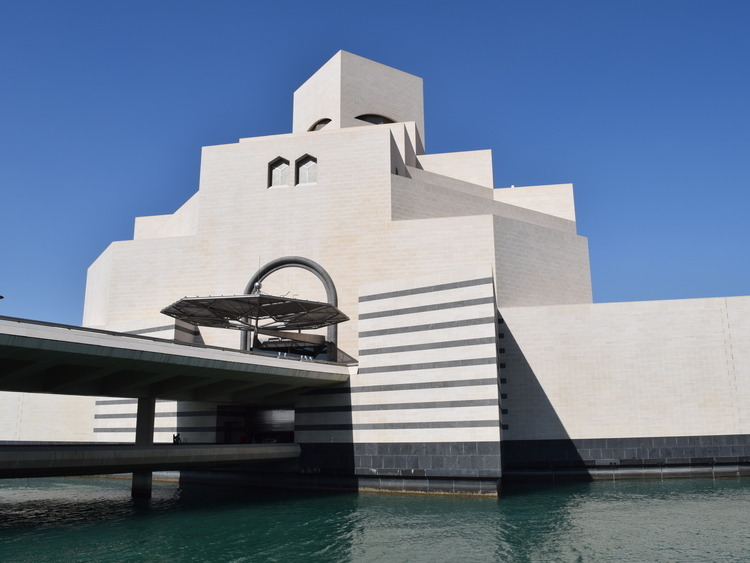 We then reach the second stop on our excursion: the Museum of Islamic Art, i.e. a modern building that seems suspended over the sea home to one of the main Islamic art collections in the world. Wandering around its rooms, we discover works of art and artefacts of great beauty spanning over 14 centuries: paintings and manuscripts, ceramics, fabrics, glass and metal objects, precious stones and jewellery from all over the Arab world. Alternatively, when the Museum of Islamic Art is closed (closing day: Tuesday), our tour takes us to another fascinating destination: the Katara Cultural Village, an elegant complex filled with theatres, galleries and structures for entertainment and cultural events that reinterprets the region's architectural heritage in an innovative way. A walk around this combination of modernity and local tradition enables us to appreciate Qatar’s culture in all of its nuances. The Museum of Islamic Art is closed on Tuesdays. In this case, an alternative visit to the Katara Cultural Village is planned.